We are thrilled to announce that our 4th Annual Youth Carnatic Music Festival on Jan. 14th and 15th will be in support of Bhumi! Help us reach our fundraising goal of $15,000! To donate to Bhumi online, click here. When you donate online, please send us an email at brindavani.usa@gmail.com telling us how much you contributed! Bhumi is one of India’s largest independent and youth volunteer non-profit organisations. Founded in 2006, the organization serves as a platform for the civic-minded youth of India to volunteer in projects relating to education, animal welfare, the environment, and health, specifically targeting the underprivileged members of society. Bhumi's volunteers, who consist entirely of individudals under the age of 30, educate and mentor children from orphanages, slums and village community centers across the country to pave a more promising future both for the children they serve and for India as a whole. 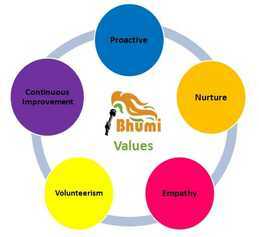 At the same time, Bhumi seeks to instill values of empathy, volunteerism, and leadership in its youth volunteers. Bhumi currently has 14 chapters (and counting) in India and engaged 12,000 volunteers in over 300,000 hours of service in 2016 alone. To help build a more influential, equal and socially conscious society. All of Bhumi's service and education is delivered completely free of charge. Therefore, Bhumi relies on donations to sustain and grow its efforts in providing for the underprivileged of India. Please contribute generously to this wonderful cause!